Have you ever wondered what happens to all of the glass bottles, PET bottles, paper and other recyclable items used during a flight? Well, you might be surprised to find out that there is actually not a big difference in how these recyclables are handled in your home and how they are handled on a plane! By correctly separating waste and recyclables on board, flight attendants have the opportunity to make a huge contribution toward protecting the environment. A few months ago, Lufthansa started a group-wide initiative called ‘Fly Greener’ to promote environmental awareness on board. As part of the initiative, crew members received demonstrations at one of our LSG Sky Chefs units in Frankfurt on how to properly recycle during a flight. The group of volunteers went even further and actually sorted waste that came in from Lufthansa flights! Lufthansa flight attendants, along with LSG Sky Chefs employees, separated waste items from 105 returned trolleys. In total, those trolleys contained 1,078 kilograms of garbage. That’s a lot of trash! The exercise was a real eye-opener for all participants involved. As a result, six large trashcans were filled with glass bottles, PET bottles and paper – all of which was recycled instead of being incinerated together with the residual waste! 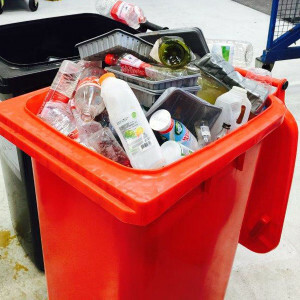 Overall, recycling on board is a win-win solution: waste that gets correctly sorted on board simplifies the caterer’s job and saves time once the waste trolleys have been returned to our facility. So, recycling is not only beneficial for the environment, but it also reduces costs at the same time. How about that? What do you think about onboard recycling?